A 6oz. 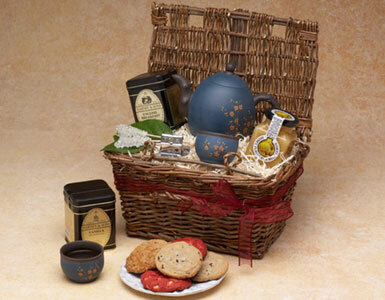 tin of premium Harney & Sons tea accompanied by a traditional Chinese tea pot with two cups, white honey, tea infuser and 6 cookies from our cookie collection presented in a willow hamper with attached lid. We specialize in tea and cookie gift baskets, gourmet tea gift baskets, tea and honey gift baskets, tea and cake gifts, Earl Grey baskets, green tea baskets, and promptly deliver your tea and cookies basket, and tea with teapot gift in Los Angeles, Beverly Hills, West Hollywood and Santa Monica.